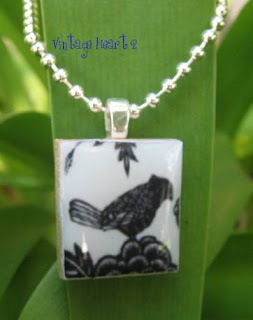 This sweet tile reminds me of black and white toile. Which I love! This pendant is elegant along with a classic look. Made with tradition scrabble game tile and a silver plated pendant bail. Each pendant comes with a 16 inch silver ball chain. Tile measures appx. 18mm x 20mm and printed on high quality paper. This gorgeous button has fast become one of my favorites. beautiful glass moonglow button pendant in lavender. There are 3 tulips surrounding a daisy like flower. All are decorated with Rhinestones in red and pale green. All in a gold setting. This button has been made into a wearable jewelry pendant. There is a silver-plated button pendant finding on the back (like the one in the photo) to wear on your favorite chain. These wonderful buttons are all so beautiful I am unable to keep mine in a case. So, I wear them! I wear them with ribbon necklaces and silver chains. Enjoy their beauty with any outfit! This is just the sweetest button! I used a silver plated bail to create a wonderful wearable jewelry pendant! 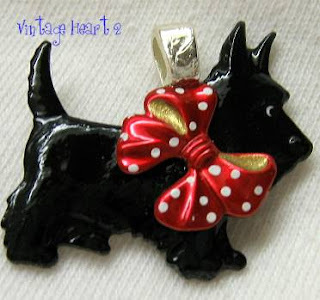 Handpainted in black with just the most adorable bow. Measures 1" at the widest point. Silver-plated pendant finding on the back for your favorite chain. This pendant has a 16" ball chain included with your order! and gold handle. Great gift for the tea lover in your life! 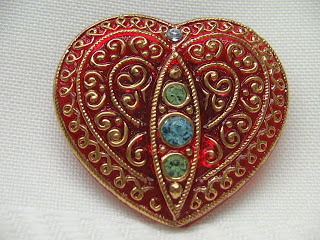 Gorgeous Czech glass rhinestone heart button pendant. for your silver necklace. Measures approx. 1 1/2" at the widest part. back to wear on your favorite chain. This is such a pretty button! I have made this into a wearable jewelry pendant. 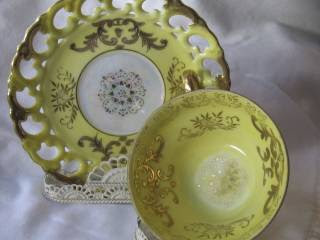 It has an opaque white glass base with raised pink ceramic (or bisque) 'forget me not' flowers covering the top. The flowers are embellished with tiny gold balls in the center. Add your favorite necklace and you have a gorgeous piece of jewelry! It is 1" in diameter. Very pretty hand painted Czech glass button. 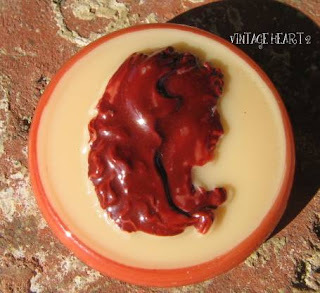 This is a dark sienna brown cameo with light tan background button made into a wearable jewelry pendant. Very nice raised details. This pendant button was made in the early 1900's. It was found in an old Czech Republic warehouse. Excellent condition with no cracks or chips. She measures just over an inch or about 27mm and has a silver-plated button pendant finding on the back for your favorite chain. These wonderful buttons are all so beautiful I am unable to keep mine in a case, so I wear them! I wear them with ribbon necklaces and silver chains. Best of luck on Flea Market Friday...beautiful treasures! 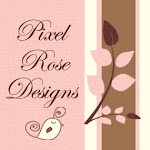 I should be up and going next week ...busy week here with my daughter moving and my Mom at the dentist! Will be back! I will be up for the first time next Friday. YIKES. Rita,Me...yep again already...lol...I can not find your e-mail on here...PLEASE go to my profile and drop me a e-mail when you can...after your last post to me we REALLY need to chat!